The grievances by which you and others found intolerable against the British King and rule was much for young colonies yet I dare say this present rule has me concerned for the country’s freedom. We have grievances of lasting injury to our rights so established under the Constitution, we should not wonder how such injuries were allowed. But, indeed they have and for a long period has such a group wanting of a transformation of freedom to oppression taken place. Grievances are piling, escalating in fact, upon each citizen after the election of the present President. How prudent can we be? We have tried carefully to use the methods put forth for us in the Constitution, as declared in our very Declaration of Independence but to no avail. Liberties, rights, all ignored, our redress of such grievances; all ignored also. Citizens are flinging their arms up in desperation, what more can they do but to wait from election to election in hopes of better legislators, new men to change and undo what has been done. Dare I even tell you of my fear? Such prudent moves are useless and we are doomed should we continue these gentle tactics. 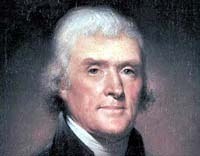 Mr. Jefferson, do you agree that we are within a time, not transient but necessary, for forced restoration of freedom from transformation of oppression? The transformation has given citizens time to settle into a slumber of promised peace with programs filled with unearned money and services; they are drunk upon these and now they slumber. We have tried to awaken the citizens finding many outraged we should call such handouts, tyrannical gifts, calling us war mongers, conspiracy inciters. With open eyes we see, clearly the country is falling, allowing its fall shall bring death, and imprisonment to those opposing it, yet fighting it brings risk of death or imprisonment also, the latter is but a risk the former a fact; I shall choose the fight. We know the tyrannical rule now shall only give their tyrannical gifts until the transformation is complete, then the citizens shall know oppression, the lack of benefits will quickly be seen, then I fear citizens shall turn upon the rule as well as us. The rule shall receive the wrath of citizens, demanding their addicted benefits, yet we shall receive equal wrath demanding why we with open eyes did nothing, allowing the fall. Ah, the fear of such wrath is worse than the fight against this tyrant we face. Shall then agree we are at the time of forced restoration? I find most comforted to expose my thoughts to you by letter, I do hope they are received without causing you to lose a peaceful rest. You sacrificed greatly and too much so to allow it all to go in vain therefore I do implore you to send your prayers henceforth expeditiously.